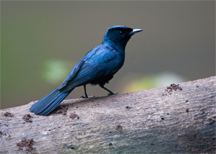 The Shining Flycatcher (Myiagra Alecto), native of Northern Australia and Southwest Pacific islands, is one of a group of about 60 species of Monarch Flycatchers (Monarchidae) whose genetic diversification patterns have been carefully studied. A 2005 paper by Christopher E. Filardi and Robert G. Moyle has turned conventional thinking on its head, by using DNA studies to show that diversity has emerged from these populations in a more isotropic pattern than was previously thought. Formerly, it was believed that continental species colonized the islands in a steppingstone pattern, one island group to the next, and that genetic diversification necessarily followed that pattern. The DNA studies show that there has been extensive backtracking in which genetically specialized forms have re-colonized previously colonized islands. The populations on many islands include genetic specializations developed not on those islands, nor on islands closer to the continents, but on islands further from the continental source of the original colonizers. The morphological similarities between the re-colonizers and the original colonizers had led earlier researchers to believe that colonization was directional — outward from the continents. But the actual colonization path, and the genetic diversification path, were far more complex. In evolution, backtracking is not really possible. What does happen is a rediscovery of prior forms, usually with small differences. So it is in product development, where we revive prior forms modified according to what we've learned on the path from which we're retreating. The term evolutionary as applied to product lifecycles may be far more apt than we realize. Photo (cc) Greg Miles, courtesy Wikipedia. Problem solving — or sometimes even just stating the problem — usually entails discovery. After successful resolution, we can look back at our path, and we usually notice new techniques, new concepts and new perspectives. For difficult problems, the path includes several failed attempts, which perhaps we used to refine either the problem statement or our approach or both. Or we decide to solve a simpler problem first, and use that experience to re-examine the original problem. Or we decide that we can't solve the original problem, but we do address the parts that seem tractable. These latter approaches are all elements of the incremental problem solving toolkit. Often, incremental problem solving produces useful results, but there is a risk that the results produced aren't optimal by any measure (see, for example, "Indicators of Lock-In: I," Point Lookout for March 23, 2011). And a string of promising results might lead not to the ultimate objective, but to a dead end. That's why backtracking is so important in the incremental toolkit, but it can be difficult or impossible to use. Why? Typically, increments produce useful capability, while they illuminate possible next steps. When customers use the capability so far delivered, more wants and needs become clear. All these lessons together help determine objectives for future increments. So it goes, iteration by iteration. Although the solving helps illuminate the path, that path might or might not lead to the final objective. When it doesn't, we must backtrack, and therein lies risk. Here are some obstacles to backtracking in incremental problem solving. Once a particular approach is embedded in the consciousness, seeing new approaches can become difficult, even when we're looking for them. Whatever we've spent so far can sometimes prevent us from trying new approaches. We might lack the resources or time to rebuild what we've done, or we might lack the daring to ask for what we need. Whether or not we have time or resources for backtracking, organizational culture might prohibit it. We push ahead because backtracking feels like failure, even when it's the only path to success. Immediately after backtracking, the cost per unit of delivered capability jumps, because cost has risen, while capability hasn't. Capability might even decline. To some, that can seem more important than enabling future success. backtracking is negativeEven when the cost is small, short-term return is negative. We're paying to go backwards. Sometimes backtracking upsets customers, who have become accustomed to a steady stream of forward progress. It can be difficult to explain the need to redevelop something customers are already happy with. Would you like to see your comments posted here? rbrenGddUJvriSzsMqxJqner@ChacdaKQXuhXNnCbUoQPoCanyon.comSend me your comments by email, or by Web form. See also Problem Solving and Creativity and Project Management for more related articles. I offer email and telephone coaching at both corporate and individual rates. Contact Rick for details at rbrensaaToVbiGpzDdYQgner@ChacMqtvkgMDILLApsDcoCanyon.com or (650) 787-6475, or toll-free in the continental US at (866) 378-5470.